● Kurt Busch started ninth, finished seventh, collecting four bonus points. ● The Monster Energy/Haas Automation Ford was involved in a multicar accident on lap three and sustained minor hood damage. ● On lap 11, Busch pitted for hood repair only and restarted 29th on lap 13. ● Busch returned to pit road on lap 63 for four tires, fuel and a wedge adjustment. He came in 15th and went out 15th. ● Was in the top-10 by lap 85. ● Busch started fifth, finished ninth, collecting two bonus points. ● The Monster Energy/Haas Automation driver pitted on lap 130 for four tires and fuel. ● Busch pitted under caution for four tires, fuel and a wedge adjustment. ● Busch started sixth, finished first, collecting five playoff points for scoring the victory. ● The Monster Energy/Haas Automation driver pitted on lap 254 for four tires, fuel and a tire pressure adjustment. ● Busch was in the top-three from lap 255-353 and pitted on lap 354 for four tires, fuel and a tire pressure adjustment. ● Busch lined up beside teammate Clint Bowyer on the lap-477 restart and was able to clear Bowyer as he exited turn two. From there, Busch survived one more restart and outlasted Kyle Larson on newer tires to bring home the win. ● Busch won the Bass Pro Shops NRA Night Race to score his 30th career Cup Series victory, his first of the season and his sixth at Bristol. His margin of victory over second-place Kyle Larson was .367 of a second. 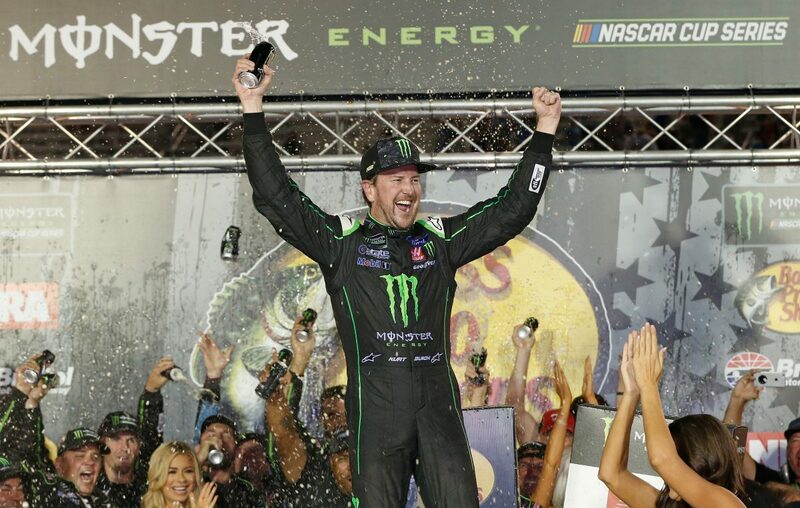 ● Busch’s triumph delivered the 100th points-paying victory for Ford’s Fusion in the Monster Energy NASCAR Cup Series. It was Ford’s 669th all-time win in the NASCAR Cup Series and its 37th victory at Bristol. ● It was also his 11th top-five and 18th top-10 at the .533-mile oval. ● Busch led once for 24 laps to increase his laps-led total at Bristol to 1,086. ● There were nine caution periods for a total of 70 laps. ● Only 15 of the 40 drivers in the Bass Pro Shops NRA Night Race finished on the lead lap. How did you take the lead? How big is it to solidify a playoff spot tonight?